Every time the word Kwatha slipped through my ears, it sounded like “KATHA” and it truly is the paragon of misheard sound, with stories evaporating from every corner – Tales going back to the days of kings and kingdom to being the only Meitei dominated village perched on the hills along the Indo-Myanmar border (Meitei’s are the major ethnic group of Manipur, spread across the plains of Manipur and not on Hills). Kwatha Village is small hamlet nestled in Tegnoupal district of Manipur. The quaint village surrounded by the Indo-Myanmar hills is 16 to 18 km away from Moreh, border town of India and Myanmar. The village is dominated by the Meitei ethnic community. Generally the Meitei’s reside on the plain landscape and the tribes reside on the hills of Manipur. But being the only Meitei populated village on hills is what sets Kwatha apart from other villages. Call it a fable or stories that bounce from one generation to another, Kwatha toss a number of engaging tales to feed the curiosity of the anxious ears. The hearsay has so far believed that the village existed since the rule of King Senbi Kiyamba from 1467 – 1508 and used as meeting point for king of Burma and Meitei King. The village, before it was inhabited, was used as resting space where the rulers of two kingdoms met and shared their cordial bond. In one such meeting, they took a flower species to their respective places and decided to meet next when the flower blooms. The flower in the Meitei kingdom bloomed early compared to the Burma side, Meitei king started off his journey with a lot of pomp, only to find Burma King has not yet arrived. After waiting for a few days he left for his throne leaving behind few people from his kingdom. It is believed that they were the first inhabitants of Kwatha – The reason behind the village being occupied by Meitei’s. Kwa means betel nut and it is believed that the village got its name due to betel nut cultivation done in mass by the early settlers. The village still has a king and every big decision of the village is passed after his consent. The signs of civilization start to fade a little as one crosses the serpentine roads, virgin woodlands and faintly audible gushing of streams to reach Kwatha. 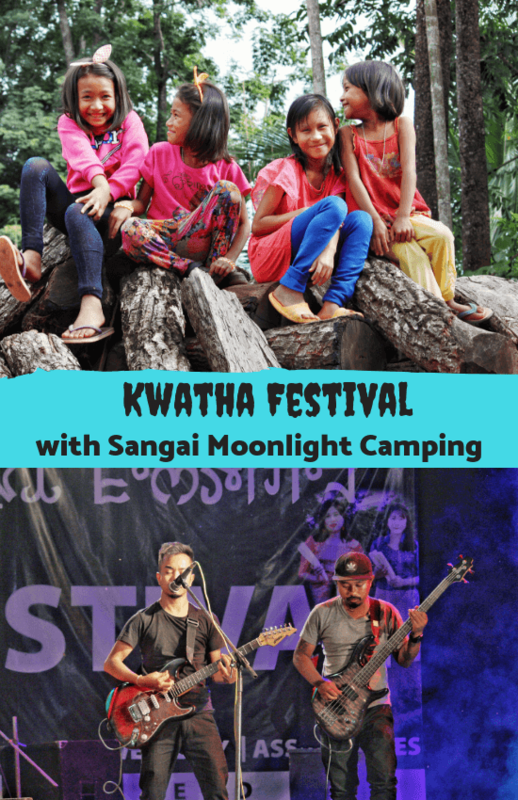 I am truly grateful to Sangai Moonlight Camping for inviting me to attend Kwatha Festival – 2018. The silence of the village atop the hills of Manipur was joyously exchanged with sounds of folk music, rock concerts, dance and traditional martial arts shows. The tiny village with a population of around 350 people geared up with their food stalls and local products, kids ran around playfully and older ones sat narrating stories passed from one generation to another. The festivals was organized on 3rd and 4th of Nov, 2018 by an NGO called as Roots for Freedom with the motive to uplift the village, bring in development and help the villagers with an alternative source of livelihood. Sangai Moonlight Camping was one of the official camping partners for the festival and definitely put up at great night of merriment at the camping sight, with bonfire, music and tons of memories. The two days of Festival were sheer delight, away from home amidst bunch of strangers, yet feeling safe and at home. The first day started at 4.30am witnessing the most spectacular sunrise from the camping site. The clouds slowly cleared to let the first rays of the sun paint the sky in orange slowly transcending into a captivating splash of bright colors. The lone church looked surreal amidst the changing colors spread across the sky. The wee hours of the morning prepared my sleepy veins to get working for the day covering the event. The event started at around 11.00 am with people pouring in from various corners of Manipur. Being the 3rd edition, this year more people attended the festival. It started with few speeches by some of the prominent figures of state who spoke in regional language about development and how to bring change in the village. The entire festival was in regional language but despite the language barrier, I enjoyed everything. The evening was grandeur of celebration with an amalgamation of dance, music and Thang Ta performance. Thang Ta is a martial art form practiced in Manipur and there were different variants of the art performed during Kwatha Festival. Right from cute kids dancing to peppy Manipuri songs to performance by popular singers and bands of Manipur, the stage was on fire and everyone enjoying to the core. The last performance by popular rock artist Sori Senjam was the perfect way to satisfactorily retire for the night. The first half of the second day was reserved for exploring the scenic natural beauty of Kwatha Village. We hiked through the forest trails on muddy narrow routes crossing boulders and rocks to reach a small waterfall hidden in the heart of the jungle. It was a small waterfall but definitely worth the climb, that splashed in synchrony forming multiple layers crossing the natural rocks that layered unevenly like stairs. The evening, with the sunset painting the sky, awaited another night of cultural shows and immerses regional music. Various bands from Manipur performed in the evening along with Thang Ta performances. The night ended with a lot of pomp and show wrapping the event in complete happiness, but we were yet to retire for the night. A camp site past the midnight immerse into another sequence of show time with the ritual music and jamming around a bonfire. Music connects people irrespective of language and I absolutely lived to this saying swaying to the notes of Manipuri Music, without understanding anything. The atmosphere seeps into you – the nip in the air, gentle breeze, bonfire to cover up the cold, music, sound of guitar strings and the vibe, sitting in a faraway village with free spirited people. Is it a tourist spot? Accommodation? Is it worth the visit? I would not say Kwatha is a tourist spot but rather a silent and small village perched on the hills of Manipur, close to the border of Myanmar. It is spread across a very small stretch of muddy road on the hills with wooden houses on both sides. The only time the village comes to life is during these two days of Kwatha festival but otherwise, it is plain and nothing exciting to do. There are no options for accommodation and only during the festival time, camping option is available. If you love to explore like a traveler to remote places, visiting during Kwatha Festival is good but something that you can skip. How do you reach Kwatha Village? I was on a sponsored trip to Kwatha Village with Sangai Moonlight Camping and did not really have to worry about my transport. But for people willing to attend Kwatha Festival, driving own vehicle is the best option. Second option is to take a shared cab or bus to Moreh from Imphal and look for a transport option for Kwatha from there. What about internet, food and other facilities? The village has no internet connectivity and the only place one can use internet is at the end of the village close to Army Cantonment. During the festival, there are many local food stalls set up by almost every house with limited food options. But, it’s a great time to try some local Manipuri food and experience something new, isn’t it? It’s a very small village with limited amenities. There is one school that educated students till class 6 post which they have to move to bigger towns. Do not expect western washrooms and even the Indian washrooms a little struggle with no running tap water. But, the overall struggle is a part of travelling my friend. The village is the only Meitei Village in Manipur tucked in the hills of Manipur. Moreh is approximately 17km drive from there and is popular for shopping. The Indo-Myanmar Friendship gate allows Indians and Myanmar citizens to cross the border up to a certain radius for shopping. The Myanmar side of the border is quite popular for shopping and something one must not miss. Kwatha Village is famous for bamboo shoot cultivation and is something that you can carry home with you while visiting the village for the festival. The population of the village is around 350 and everybody knows each other, that being said it is easy to identify an outsider. 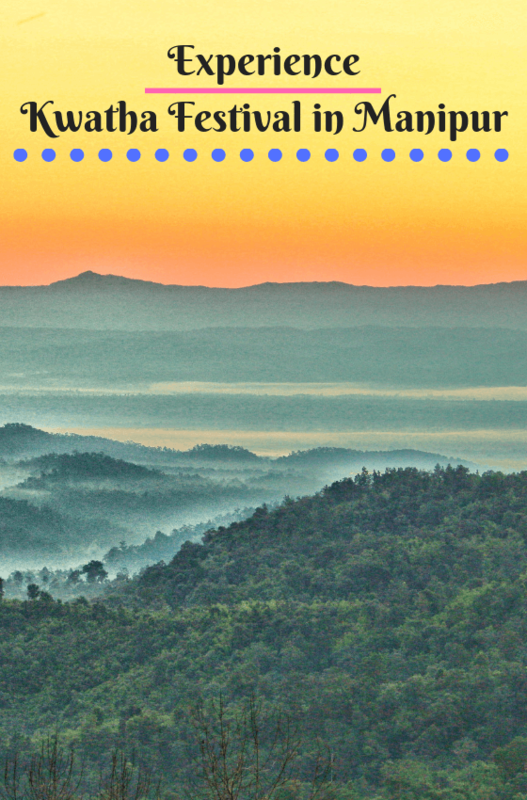 Disclaimer – My trip to Kwatha Village and the festival was sponsored by Sangai Moonlight Camping. But, the thoughts are completely mine. For more information, you can read my blog about Sangai moonlight Camping and Life around Loktak Lake.